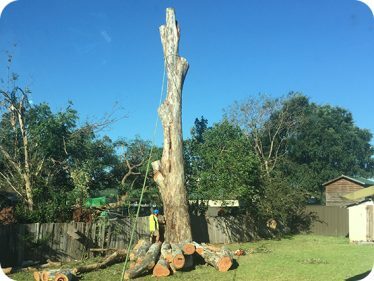 Tree felling is the art of removing the final piece of a tree and ensuring that it falls in a safe and designated area, causing as little disruption to the surrounding landscape as possible. It can take a lot of careful planning to make sure everything goes to plan. To be considered are factors such as the way the tree leans and the slope of the ground. Our professional arborists have extensive experience in felling trees and removing them safely and efficiently. Our team has extensive experience in tree felling and have worked in some of the tightest of areas with great success. Tree felling is necessary if the existence of the trunk is likely to cause a hazard. It is also recommended if you are removing a tree so as to completely clean up the area you are trying to clear. If you are unsure as to whether you need this service we offer risk management advice to guide you through your options.